Digga’s heavy duty 72” Rotary Axe is the ultimate attachment for clearing & shredding thick bush & scrub. Working in conjunction with the heavy duty push bar, the front hood opens up exposing the ¾” blades past the guards, enabling close up axe-like cuts to remove trees up to 7” (180mm) in diameter. For the ultimate in clearing, carbide teeth have been added to the spinning disc to effectively remove stumps and create a clear path. The Rotary Axe boasts a world leading design as well as quality construction for increased productivity, reliability, and ease of maintenance. A Rotary Axe is used for vegetation clearing, preparing sites for construction projects, clearing trails, scrub and undergrowth as well as shredding branches and saplings. 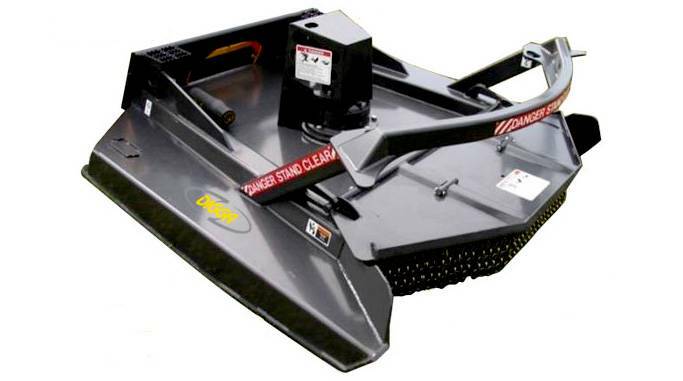 it is ideal for cleaning up fire breaks, clearing orchards, lease reclamations, or fence line maintenance. Highly visible pressure gauge – Prevents excessive stalling causing overheating. Provides feedback to operator to help maintain peak performance. Protected direct drive system for smoother, quieter operation. Stump grinding carbide teeth increase shredding performance and allow stump removal. Chain curtain included for debris suppression. Steel ‘clean deck’ design helps keep the deck clear of debris. Easier to clean and maintain. Heavy duty construction allows for lower centre of gravity and better stability on hillsides. For pricing or more information about the Rotary Axe fill out the form and we&apos;ll be in touch soon. Alternatively call (08) 9457 1544.